I enjoy (and have gone through many times) the process of helping first-time gun buyers / first-time gun owners select the “correct” gun for them. The most interesting thing that I see when helping someone select their first handgun, is that they usually end up with something completely different from what they initially thought. I’ll tell you a story about a good friend of mine, who in her early 50s decided she wanted to get a gun. Again my first question to her was, “What are you going to be using it for?” And she said, “Honestly, I’m not sure“. While I appreciated her honesty, I told her she needed to think about what she primarily wanted the gun for. Over the next few days we chatted a few times about exactly what she wanted her first gun to be. After our discussions, she finally decided that she wanted it to be a handgun and that it needed to also be easy to shoot / operate. She thought she was leaning towards a full-size service pistol. So, I told her I had a variety of pistols that she could try and I would be willing to help out anyway I could. Over the next month or so, we went shooting with many different types of handguns; from revolvers, sub-compact and compact semi-automatics, up to full-size 1911s. After my friend had shot a wide selection of my handguns and was also shown the features of those guns, she finally ended up selecting the Springfield Armory XD-S® in 9mm. I was slightly surprised that she picked this particular pistol, as initially she thought she wanted a full-size service pistol. 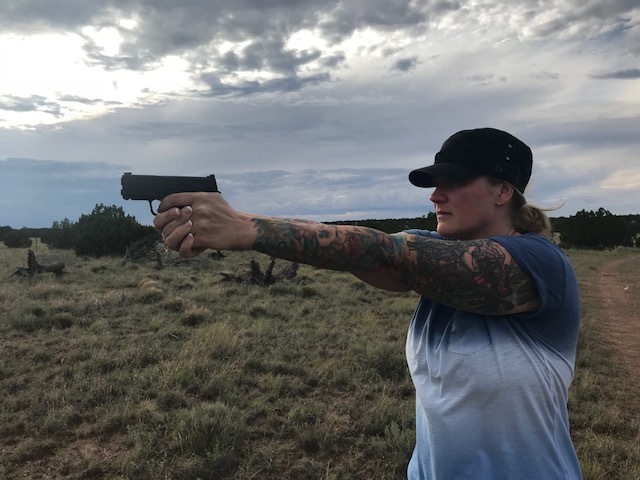 After all the test firing of over a dozen different guns, my friend told me that the XD-S® 9mm fit every requirement that she was looking for. The XD-S® was a do-it-all handgun for her particular situation. I took her out shooting many times after she bought her XD-S®. I taught her to be comfortable and proficient with the gun. And I made sure she understood all of the features and functions that the pistol had to offer. I put her through drills that forced her to draw the gun and fire at multiple targets, perform a few different types of reloads, and showed her the proper technique of how to work the trigger. After all was said and done, she was even more thrilled with her choice of the Springfield Armory XD-S® 9mm. I use this example of this one friend in particular, but I've helped many friends over the last several years select guns, and all but two new shooters chose the Springfield Armory XD-S®. And those friends chose Springfield’s XD Mod.2®. When decided, I asked them "why" they chose that particular gun. And in each case (with the XD-S®), all say that the gun checked the boxes for the features that they were looking for in a first handgun. I must note, that each person that purchased the XD-S®, chose it in 9mm. My friends also made similar comments about what they liked. First and foremost was the “controllability” of the pistol. Now, they didn’t use that term, but they described it as liking the way the gun “reacted” and/or liking the way it “felt” when they shot it. Next in terms of their priorities / likability was the small size of the pistol. Conceal-ability was a big consideration for most of them! Living in Arizona, a right-to-carry state, many first-time gun buyers are purchasing a hand gun for self-defense and concealed carry. And I’d agree with my new shooting friends - that the above are all really great features and good reasons to buy a small concealable pistol, which is why the Springfield Armory XD-S® in 9mm has been such a huge success! With the popularity of the original XD-S®, it only made sense for Springfield to add the “Mod. 2”, to this configuration of pistol. Now, I am a big fan of the original XD-S® in all calibers, 9mm, .40, and .45! So, when I heard that there would be a change to the XD-S® line of pistols, I thought, “What could the engineers at Springfield Armory possibly do to improve upon this gun?” Then I got my hands on the sample of the XD-S Mod.2® in 9 mm. Let me just say this, these few minor changes have made the gun all the more desirable for me. The obvious visual changes are apparent, but the ergonomics and the feel of the pistol were changed just enough to make it grip differently, and the X-Tension™ magazines are just a better fit for my larger hands. To check out the new XD-S Mod.2® 9mm for yourself, find a gun shop near you on Springfield’s retailer locator page!